The aim of the study was to evaluate individual inflammatory response after inguinal hernioplasty by measuring baseline and post-operative serum IL-6 response to surgery and quantifying the variability of the serum response in a homogeneous group of patients.Patients enrolled in the study underwent inguinal hernioplasty. 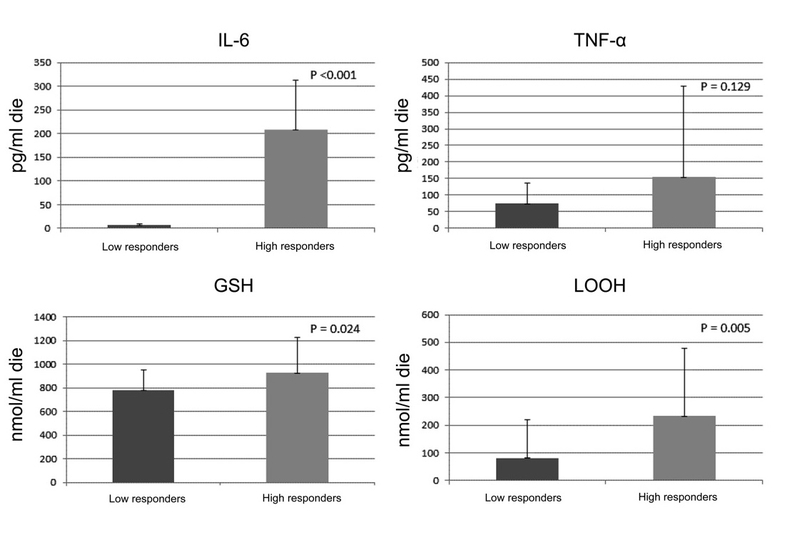 Blood samples were used to analyze serum IL-6, TNF-alpha, LOOH and GSH levels. To identify high and low IL-6 responders, patients were divided into 2 groups according median values of the peak levels of IL-6. Mean levels of the cytokine were comparable at baseline but reached peak at 6 h and persisted elevated at following hours among high responders whereas remained significantly lower over time among low responders.Patients identified as low responders showed not significant changes in serum IL-6 levels over the post-operative period. In contrast, high responders demonstrated a significant response reaching the peak level of IL-6 after 6 hours post operation.